We're back again with our winners! Before we announce them, we hope you had the opportunity to take our Craft Space Blog Hop this past weekend. There were so many creative ideas that were shared by our Design Team members. If you missed it, click here to check it out! If you are looking for the winner of our blog hop prize, please click here. Congratulations, Ladies! If you would like a Top 3 Blinkie for your blog, please contact Ann at november-rose@hotmail.com. Congratulations, Lisa! You have won the Bo Bunny 6X6 Camp A Lot paper from Ginger Snap Scraps. Please contact Ann at november-rose@hotmail.com to claim your prize. 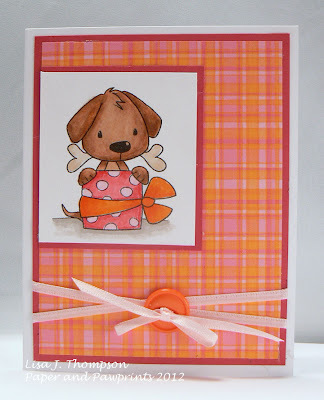 Many thanks to Cori, at Ginger Snap Scraps for sponsoring this challenge! Stop back tomorrow for our new sketch! Thanks for choosing my card as one of the DT faves! Sooooo cool! And thanks for the great inspirations!